Guaranteed Low Cost Warsaw Airport Transfer service - most comfortable and convenient way to travel from and to Warsaw and considerably cheaper than the Warsaw Taxi service using taximeter. 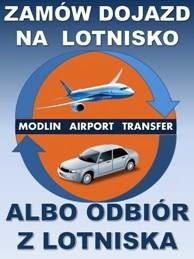 - private transfer service from Modlin Airport to any place in Warsaw or Poland. 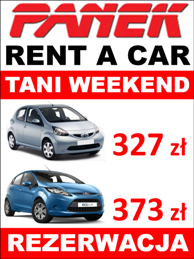 - rates are fixed, arranged during the booking process and guaranteed. - You don't need to pay in advance - You can pay when transfer is finished. - even if Your flight has a delay, Your driver will wait for You at the airport. ​- Time of transfer: c.a. 35 minutes to Warsaw city center. The airport handles short- and medium-range international routes. 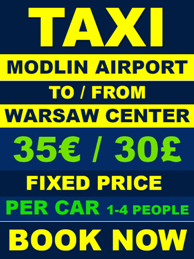 Warsaw-Modlin Airport is located about 40 km north-west of the city center. Originally the Modlin air field was used for military purposes during the World War II. The new commercial airport opened on July 16th 2012. Currently, there are one low cost carriers operating from the Warsaw Modlin Airport – Ryanair. The 12,050 square meters passanger Terminal was designed by Studio Architecture Kuryłowicz Authors & Associates Ltd.. of o.o. In the commercial zone of the terminal there are 4 shops EUROSHOP (including 3 tax-free), 2 kiosks, exchange office and 4 dining outlets. At the terminal, you can enjoy free WIFI access. Time of transfer: c.a. 35 minutes to Warsaw city center.